Data in computers is stored and transmitted as a series of ones and zeros (also known as Binary). To store an image on a computer, the image is broken down into tiny elements called pixels. A pixel (short for picture element) represents one colour. An image with a resolution of 1024 by 798 pixels has 1024 x 798 pixels (817,152 pixels). In order for the computer to store the image, each pixel is represented by a binary value. We call this representation of colours a “bit-plane”. Each bit doubles the number of available colours i.e. 1-bit would give us 2 colours, 2-bits would give us 4 colours and 3-bits would give us 8 colours etc. In a monochrome (two colour) image, like the example below, just 1 bit is needed to represent each pixel e.g. 0 for white and 1 for black. We call this extra piece of information “metadata”. Once the students have completed the tutorial, challenge them to create their own 8-bit pixel artwork. 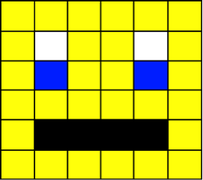 Tip: If students are finding it difficult to create their own artwork, they can attempt the minion pixel art tutorial by Ray Chambers. Explain to students that data in computers is stored and transmitted as a series of ones and zeros, also referred to as “Binary”. Display the following simple 1-bit image on the board and ask students to suggest how it could be converted to binary. Try to draw out answers such as "Use 0 to represent white and 1 to represent black" or "Use 0 to represent black and 1 to represent white". Explain to students that, in a computer, an image is broken down into tiny elements called pixels and that each pixel (short for picture element) represents one colour. Explain that an image with a resolution of 1024 by 798 pixels has 1024 x 798 pixels (817,152 pixels). Tell students that, in order for the computer to store the image, each pixel is represented by a binary value (One or Zero). Explain that we call this representation of colours a “bit-plane” and that each bit doubles the number of available colours i.e. 1-bit would give us 2 colours, 2-bits would give us 4 colours and 3-bits would give us 8 colours etc. Demonstrate this using the 2 colour and 4 colour images in the introduction (above). After showing students how a computer would represent a 2 colour and 4 colour image, ask the students to suggest how we could store more colours such as 16, 256 etc. Explain to students that an image represented by 24-bits would have 16 million colours - 16,777,216 to be precise. Finally, hand out the following worksheets and ask the students to copy the image they created in touchdevelop onto the grids provided. Once the students have transferred their images tn their worksheets, instruct the students to convert their image into binary (as if they were a computer). Students can share the binary code of their favourite bitmap image with a classmate to see if they could convert it back to the original image. Write the following binary example on the board and ask the students how the computer would interpret the numbers. Finish by recapping the learning objectives using the Pose, Pause, Pounce and Bounce method. Students can continue to work on their 8-bit pixel artwork and publish their work when they have finished. TouchDevelop "8-bit Challenge" lesson is licenced under a Creative Commons Attribution 4.0 International License.